29.gxh6 Rxd5 30.hxg7 Kxg7 31.f6+ Kxf6 32.Qf3+ Ke6 33.Qg4+ f5 34.Qg8+ Kd7 35.Qxd5 Qxc6 36.Qf7+ Be7 37.Qxf5+ Ke8 38.Qg6+ Kf8 39.Be3 Bd8 40.Bh6+ Ke7 41.Bg5+ Kd7 42.Qf7+ Kc8 43.Qe6+ Kc7 44.Qf7+ Kc8 45.Qe6+ Kc7 46.Qf7+ Kc8 47.Qe6+, draw. New Jersey's first match is on Tuesday, September 4th, versus New England. Michael O'Connor is moving from the coffeehouse to the roadhouse! 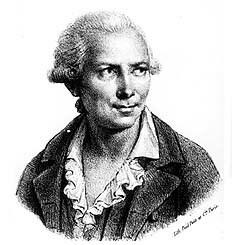 Michael has recently begun playing the Philidor Counter Gambit, often criticized as "coffeehouse chess" even though it is usually White who initiates the tactics. 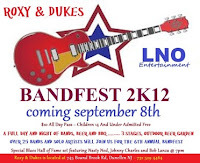 On Saturday, September 8th, his band Mikell's Plot will appear during Bandfest 2K12, at Roxy & Dukes Roadhouse/745 Bound Brook Road/Dunellen NJ. They are scheduled to perform this song at 3pm on the indoor stage. Doors open at 2pm. Admission is $10 for adults and $5 for children, who must be accompanied by an adult. I plan on being in attendance to take pictures. At Contre Gambit Philidor, Frederic Fournier analyzes Lev Zilbermintz's recent victories against GM Enrique Rodriguez Guerrero and Christopher Moravek. Fournier also provides a link to Lev's draw against GM Nigel Davies. On Sunday, I won a minor piece endgame at the Marshall Chess Club, in the New York State Senior Championship tournament. 48.Be7 Kb6 49.Bd6 Ka6 50.Be5 Kb6 51.Bd4+ Ka6 52.Kc3 Nd8 53.Bc5 Ne6 54.Bf2 Kb7 55.b5 c5 56.a5 d4+ 57.Kc4 Kc7 58.Be1 Kd6 59.a6 Nc7 60.Ba5 d3 61.Bxc7+ Kxc7 62.Kxd3 Kb6 63.Kc4 Kc7 64.Kxc5, Black resigns. Watch these videos of my lecture, on August 14th, at the Marshall Chess Club! Here are parts one, two, and three. This autumn, Columbia Academy will be offering chess classes every Tuesday. A first free chess class will meet on September 11, 2012, from 7:05pm. to 8:05pm. All classes are held at Caldwell College. Columbia Academy has been undertaking marketing efforts and hopes to extend its chess program to Saturdays, if there is sufficient enrollment. You can contact Alex Iovel at the following e-mail address info@columbiaacademyus.com, if you are interested in attending. Or you can reach Alex by phone at 973-599-0221. On Wednesday, I finished the game/90 tournament at Chess Mates with a score of 3-0-1. 31.bxc5 Rc7 32.Rb1 Rxc5 33.Rb6+ Kd5 34.Rd6+ Kc4 35.e6 Kb4 36.e7 Rxc2+ 37.Ke1, Black resigns. On Sunday, I took these pictures at the Monmouth Chess School and Club, during the Red Bank Open tournament. During Saturday's grand prix tournament at Chess Mates, I snapped these photos. Magnus Carlsen made an appearance at the Marshall Chess Club, during last night's FIDE Mondays tournament. In this game, both players blundered in time trouble. 47.Qe4+ Ka7 48.Qe2 Qa1+ 49.Kg2 a4 50.Qe4 Ka6 51.Qa8+ Kb5 52.Qd5+ Ka6 53.Qa8+ Kb5 54.Qd5+ Ka6 55.Qa8+ Kb5 56.Qd5+, draw. On Sunday, I finished with a score of 2-1-1 in the game/30 Swiss, at the Monmouth Chess School and Club. Candidate master Lev Zilbermintz won this PCG. 31.Qf4 b2 32.f3 b1=Q+ 33.Kf2 e3+ 34.Kg3 Nh5+, White resigns. 26 players showed up for yesterday's grand prix tournament at Chess Mates. 18.O-O Bd6 19.f4 exf3 20.Bxg4 Bxg3, White resigns. Ed Zwick to Direct "Pawn Sacrifice"